Just seventy-five miles north of Los Angeles, Ojai is a world apart. Known for the "pink moment" that appears every evening at sunset, it's no wonder Frank Capra shot his movie about Shangri-La here in 1937. There are many lovely places to stay, but spa-lovers will focus on just two, very different properties. 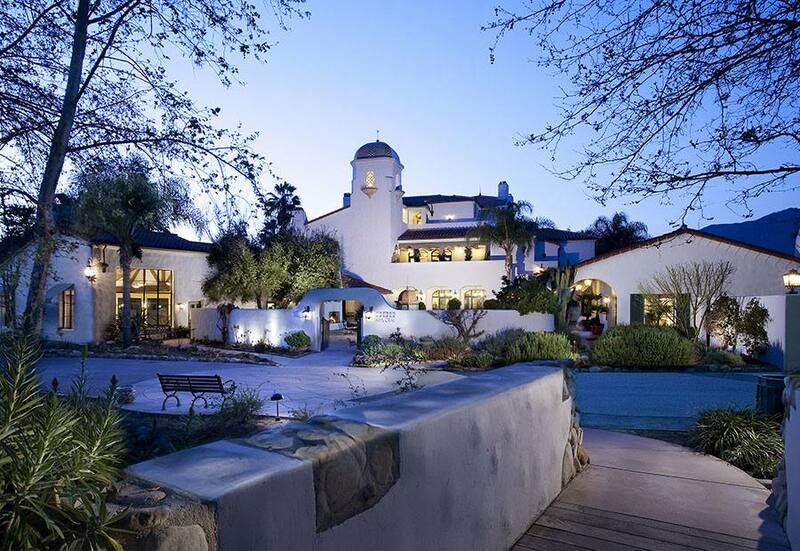 Set on 220-oak studded acres, this is a luxurious resort has a pedigree going back to 1923 when Toledo glass magnate Edward Libbey built a private Spanish-style clubhouse and an 18-hole golf course designed by George C. Thomas. Today it has 305 guest rooms, including 60 romantic suites with fireplaces, and one of the most interesting resort spas in the country, designed by Sylvia Sepielli. Spa Ojai is a 31,000 square foot luxury spa and wellness retreat with 28 treatment areas, signature Moroccan tiled Kuyam mud therapy chamber, multiple pools, athletic center, and mind/body studio with a daily schedule of complimentary classes including t’ai chi, yoga and qigong. The surrounding Spa Village includes a working artist studio with classes led by local artists and apothecary for custom scent blending. With suites newly built inside the on-site Spa Village, guests can stay within footsteps of their next treatment. Forgot your sunglasses at the pool? There’s an Oliver Peoples concierge on hand to assist. And if golfing helps you de-stress, Bentley-inspired golf carts and caddies are on hand to ensure a good game. It is the first location to offer The Somadome Personal Meditation Pod, which introduces guests to new levels of relaxation and meditation with unprecedented efficacy -- twenty minutes is all it takes. It is the newest addition to Ojai Valley Inn & Spa’s menu of offerings which pay homage to the spiritual roots originally established in the area by the Chumash Indians. Options ranging from spiritual counseling with an on-property healer and intuitive to detoxifying mud treatments paired with guided chanting, provide clarity, interpretation and spiritual perspective to guests of Spa Ojai. Set right in the charming village of Ojai, The Oaks at Ojai is the affordable fitness destination spa that inspired Mel Zuckerman to open Canyon Ranch back in the '70s. It calls itself "America's best spa value" because of its weekly rate of $2,415 per person ($1,820 double occupancy). This includes overnight accommodations, three delicious and calorie-conscious meals a day designed to promote weight loss, your choice of 15 fitness classes per day, and evening entertainment and seminars. The 1920s Mission-style hotel-turned-spa has 46 guest rooms, including private rooms and courtyard suites, double lodge rooms and double cottage rooms. Just need a day or two? Oaks at Ojai has a plan for you too, with a daily rate of $345 ($260 double occupancy). Classes include walking, hiking, swimming and fitness classes such as stretching, dancing, cardio sculpting, yoga, and Pilates. Guests are encouraged to take as few or as many classes as they would like. The Oaks at Ojai was founded by Sheila Cluff, a wellness visionary who created cardiovascular dance in the 1950s, later known as “aerobics,” and pioneered the concept of the modern destination spa in the 1970s. The author of four books, producer of four fitness videos, and leader of more than 40 fitness and beauty cruises, Cluff personally helps participants attain individual power through healthful living. After four decades of great success, she still makes time to teach at least five classes per week at The Oaks at Ojai and know her guests by name. 122 E. Ojai Ave., Ojai; (805) 646-5573. What Are the Best Day Spas in Los Angeles?